Use hydrogen peroxide. Apply to the mattress and blot it while it is bubbling. This may not remove all the stain, but will help to lessen it. Be sure to blot it with a clean, white, dry cloth. Rinse with cold water (hot cooks the proteins). Rub in meat tenderizer from the pantry which removes the proteins. Rinse and follow up as per rust removal to remove the iron found in the blood. You can also add in salt to plain water and pour the solution into a spray bottle. This is particularly effective in removing fresh blood stains. Create a baking soda solution. Mix one part baking soda and two parts cold water in a large bowl to make a solution. Apply it on the area using a clean cloth and let it sit for 30 minutes. Use a cloth damped in cold water to rinse the remaining solution and then apply a dry towel to absorb the moisture. Apply detergent. Mix 1 tablespoon of liquid dish washing detergent with two cups of cold water in a bowl. Soak a white cloth in the solution and apply to the affected area. Gently brush the affected area with a toothbrush and rinse the solution by blotting with a wet cloth. Use a cloth towel to dry the stained area. 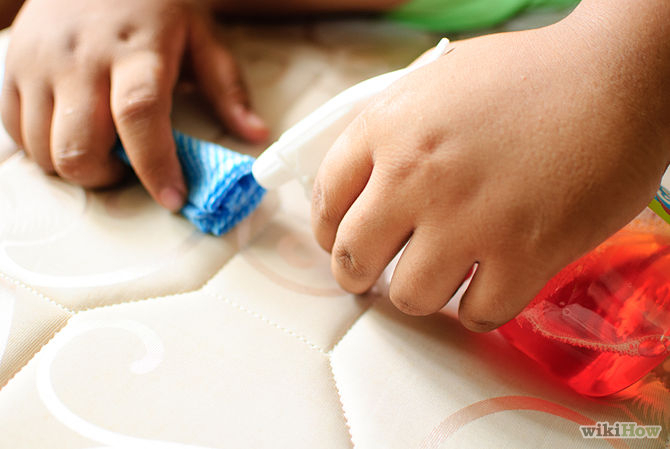 Using the same processes as above, apply it to the entire mattress, one section at a time. Launder your linens frequently. If you smoke, you should do this even more often than you would on an ordinary basis. This will help keep the odor from being so pervasive. Spray the odor out. Use two large cans of Lysol spray (one for each side) and saturate the mattress. Let it dry for a couple of days and then follow up with two large bottles of Febreze. Place a hypoallergenic mattress pad cover on. Give your mattresses a ‘suntan’. These types of stains are caused by too much moisture. Try taking your mattress outside on a bright, sunny day and let the sun dry it out. Try to remove the excess mold and mildew by wiping or sweeping it off. Vacuum your mattress on both sides. When you’ve finished, dispose of the vacuum’s filter and bag. This will prevent the mold spores from leaking out the next time you use the vacuum. Mix equal parts of isopropyl alcohol and warm water. Sponge it onto the mattress. Rinse the area with warm water. Use a common disinfectant. Products such as Lysol will kill any spores that linger. Use an enzyme based cleaning product. These digest the uric acid crystals at the source of the stain. Spray the stain and methodically blot it. Once dry, shake baking soda over it. Let it set overnight and vacuum it the next day. You can also create a mixture using 8 ounces of hydrogen peroxide and 3 tablespoons of baking soda. This works best as a spray. Mix teaspoon of water in a mixing bowl. Add 1 tablespoon of vinegar, a teaspoon of laundry detergent your choice or dishwasher detergent. Add 2 tablespoons of baking soda and about 1 drop of disinfecting cleaner such as Lysol or Mr Clean. Have a dry cloth handy and one to dip in solution. Sponge or blot the solution into the mattress. Press down hard. When done, wipe the surface with water. Do not pour onto the mattress––just blot dry. Apply a thin layer of baking soda on the mattress for several hours. The more added, the better and if you can leave overnight, that’s ideal. Let the stain remover dry. Vacuum up the baking soda when it has dried. Apply a proprietary anti-odor product, such as Febreze. Put laundry drying sheets on the spot and let them stand for 30 minutes or longer. Check if completely dry. When it is dry, it should be clean and smell odor-free. Repeat this process in another week for complete assurance. Use a citrus cleaner or vinegar. Apply either of these as a spray or onto a clean white cloth. The acid in them will help remove the stains. Apply rubbing alcohol. Alcohol will help carry the stain further. Blot the stain with a clean absorbent cloth soaked in rubbing alcohol, rather than pouring it on the stain. Talk to your mattress manufacturer or local dry cleaner. They will also have information on removing stains or provide a service for a fee.